There are generally three types of customers who buy our CNC machines. The first type just wants to have fun learning the technology. The second type already manufactures a product and needs a CNC machine to expand his business or make his processes more efficient. The final type is looking for a way to make money on the side or even create his or her own fulltime job. If you are the third type of customer, this blog post is for you. I personally made money on the side with CNC made products before MillRight CNC became so large that it consumed my full-time attention, so I think you’ll find this advice useful and, hopefully, profitable too! The first step to making money with CNC is developing a proficiency with the technology. As I mentioned in last week’s blog post, you must be willing to learn. You won’t make money right off the bat because you won’t be efficient enough to churn out profitable work. Through some effort and commitment to your purpose, you’ll find operating the machine and designing parts and art as simple as any other task you undertake on a regular basis. After you’ve developed some proficiency with CNC, you are ready to start trying to bring in some money. There are two basic ways you can generate revenue: Develop and market your own products or enhance the products and services of other businesses. Start by thinking about what you are passionate about. You are much more likely to succeed and give your new venture sufficient effort if it is something that you truly care about and enjoy. Once you’ve made a short list of products that you enjoy or have a personal passion for, consider their marketability. Search the internet for what you want to produce. Is it listed for sale? If so, that’s a great indication that there are buyers out there who want it. Is everyone selling them? That’s a product to stay away from, unless you can specialize within that product group. For instance, if you are passionate about keepsake boxes, go to www.etsy.com and search for the phrase. I got 46,935 results. That’s a lot of competition, but maybe not if you offer the right style or cater to the right niche within that product group. Next, think about the manufacturability of your product and what productive capacity you need to achieve a profitable throughput. The great thing about our line of machines is that their low prices allow for potentially quick payback and a great return on investment. With that said though, you need to make sure that the machine you select can cut the products in the time frame you require. As you move up our product line, you not only increase the size of the pieces that you can cut, but also the speed with which you will finish your projects and the number of pieces that you can cut on the bed at one time. To put this in perspective, the Power Route can finish a single piece about 12 times faster than the M3 can! The M3 is great and offers a quicker return on investment for a small craft business than probably any machine out there, but you must make sure your production plans align with your production capability. Considering the channels through which you can sell your products is of equal importance. One great place that I already mentioned is etsy.com. If you have any decorative ware or artistic product, you absolutely should be listing it there. Trade shows and craft fairs are also an excellent outlet for your products. Many of these venues charge a small fee for booth space, but there is no better way to get direct feedback on your products and their prices. Trade shows and craft fairs can be difficult when you first start, however, because it’s tricky to gauge how much inventory you need to pre-produce. Take the time to create a Facebook page for your business and ask your friends and family to spread the word. Facebook is great in that it allows you to do very targeted advertising based on the demographic and interest profile that is compatible with your product. For instance, if your business offers custom engraved child’s name door signs, you can likely find interests and demographic audiences on Facebook that will appreciate your product and might even share it with their friends, parent groups, etc. You can also create your own website, but I encourage everyone to do some market testing through the other channels before going through the effort of creating your own website. Finally, brick and motor retail isn’t dead. Gift shops and boutiques are constantly looking for interesting products relevant to their customers. Some will charge you a slotting fee, where you pay for a section within the store to display your products. Others will even be willing to give you a purchase order to buy a bunch of your products at one time at wholesale pricing. What does it mean for you to enhance the products or services of existing businesses? It means finding a way to use your machine’s capabilities and your proficiency with running it to help other businesses improve their products or expand what they can offer to their customers. Businesses are always looking for ways to get better, make their products faster, and generate more revenue. Brainstorm for a while about the kind of business that can be made better with your CNC services. These businesses are usually small, have “hand-worked” processes, and access to a lot of customers. “Mom and Pop” sign and print shops are a great place to pitch your services. They often don’t have the capability to produce custom engraved work for their customers. Many likely turn down customer requests because they just don’t have the capability in house or don’t even know who to call to have custom engraved pieces made. Some of these shops will even refer customers to you directly for no fee because they are happy to provide a solution to their customers and help another local business at the same time. Wedding venues are another great place to offer your services. These venues often provide a souvenir to their clients that commemorates the event. Offer to make beautiful custom engraved keepsakes for the happy couple. Also consider local furniture makers. These can be people selling porch swings at the local hardware store or dressers at the local farmer’s market. 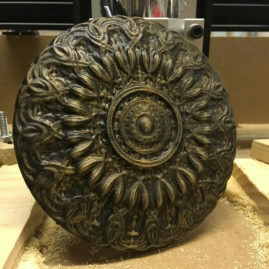 Explain to the craftsman that getting custom engravings or beautiful adornments like this one from you will increase the demand for their furniture pieces. You need to be prepared when you approach any of these businesses. While every business owner is looking for new ways to make money, many are going to be hesitant about what you have to offer. There is no better way to overcome that skepticism than showing them all the great things you’ve already made. Show up with a box of existing projects you’ve completed with your MillRight CNC machine and show off your work! Suggest ways that some of your example pieces could be adapted to their application or expand what they offer. Be clear with your newfound business partners about your timelines and restrictions. If this is a side business that you only tend on the weekends, they need to understand this so they can better tie your capabilities into their products and services. Be realistic with yourself about what you can accomplish. An order for 300 intricately engraved dresser drawer fronts is exciting, but you can’t finish it over one weekend. Your newfound business partners will appreciate your candor. This is only scratching the surface of all the different ways you can earn an income with your CNC machine. I hope I’ve inspired some ideas in you. Whether you are making your projects for profit or just for your own personal enjoyment, I hope you’ll show off what you make on our projects forum. Leave us your comments. Let us know how you make money with your CNC machine. Great info for us budding entrepreneurs. Thanks for your insight, Derek. I never thought about working with local shops. And I just made a few signs for my own daughter’s wedding. Great ideas. My development in specialized engineering components is bearing fruit. Luckily I have an extensive machine development and machining background. But for hobby enthusiasts, this could also be a source of revenue. You will first have to input the information into CAD software, such as Fusion 360. The blueprint itself was most likely generated in CAD software initially. You might want to check to see if whoever provided you the blueprint can also provide you a DXF file. If they can’t you just take all that information conveyed in the blueprint and digitize it. For instance, if the blueprint shows a through hole 1 inch from another feature, you can input that same information into a CAD sketch. From the CAD file you develop, you’ll use CAM (Fusion has CAM built in) to tell the machine how to cut it. You provide information such as which cutter will machine which features, how fast it will go, etc. I’d encourage you to come by our forum at http://www.millrightcnc.proboards.com and see the processes that our customers go through. You can also watch some of the video tutorials there. If you aren’t interested in manufacturing yourself, you might want to email the blueprint and relevant information to sales@millrightcnc.com. We have a full machine shop and we could probably do some manufacturing for you.